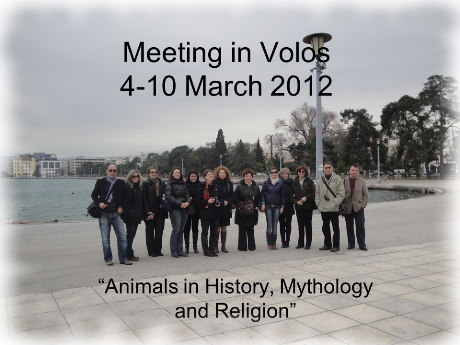 Topic: "Animals in mythology, literature and religion"
" Arrival of the German guests at midnight at the Volos Bus station.
" Arrival of the Italian guests at the Volos bus station at 15.30.
" Arrival of the Bulgarian guests from Dobrich at the Volos bus station at 16.00.
" Arrival of the Spanish and Portuguese guests at the Volos bus station at 19.00.
" Afternoon/Evening free for the students to spend time with the host families.
" 08.30: Welcome at school and meeting with the school headmaster Mr. Karaferis.
" 09.00-09.45: Presentation of the meeting programme. 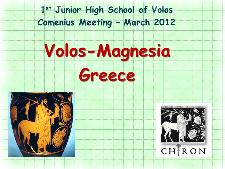 Presentations about Greece, Volos and our school.
" 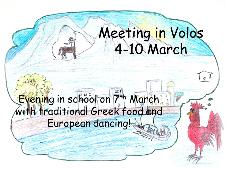 09.45 - 11.00: Work presentations on the topic of the Volos meeting.
" 11.00-12.00: Coffee break at the teachers' office and tour of the school grounds for both students and teachers.
" 12.00-13.45: Remaining work presentations and discussion on the topic.
" 13.45: Students go home for lunch and free afternoon/evening to see the sights in Volos.
" Teachers have a short sightseeing tour of the city and a walk along the waterfront. Dinner at one of the traditional seafood taverns (tsipouradiko). 08.00 - 19.30: Educational bus trip to Meteora, one of the largest and most important complexes of Eastern Orthodox monasteries in Greece included on the UNESCO World Heritage List.
" 08.00 Meeting at school and departure. Arrival in Meteora at 10.45 with a short stop on the way.
" 11.00-12.00: Guided visit of the Monastery of St Stephanos.
" 12.15- 14.00: Guided visit of the Varlaam Monastery. Departure for the city of Trikala.
" 15.00-17.00: Short sightseeing tour of the city of Trikala. Lunch and coffee for the teachers. Free time for the students to walk through the "Manavika" pedestrian zone and have lunch. Departure for Volos at 17.00.
" 19.30: Arrival in Volos. 8.00 - 14.00: Bus trip to Makrinitsa, known as the balcony of Mt. Pelion, a village 16 km from Volos with many old traditional houses, mansions and cobble-stoned paths for walking. Visit at the Environmental Education Centre of Makrinitsa.
" 8.00: Meeting at school and departure by bus for the Theofilos Museum.
" 8.20- 9.00: Visit to Theofilos Museum, a mansion in Anakasia with frescoes by the folk artist Theofilos.
" 9.30 -12.00: Visit at the Environmental Education Centre of Makrinitsa. Programme to acquaint students with the village and Mount Pelion and visit at the Topali Mansion, a museum of Folk Art and Pelion History (for guest students and teachers). Greek students will attend a different programme (because of lack of space at the museum).
" 13.00: Departure for Volos and arrival at school at 13.45.
" 14.00-16.00: Presentation of the stories from each country for the creation of a common book (end product of the programme). Students' team work to put the book together. !! 19.30: Party at school with food cooked by the students' parents and traditional (and not only) music and dancing.
" 8.30: Meeting at school.
" 8.45-9.35: Guest students attend lessons. Teachers' meeting and discussion about the book and the programme. 10.00-16.00: Bus trip to Milies and Vizitsa, two traditional mountainous villages about 30km from Volos.
" 10.00: Departure from school.
" 11.00: Visit to the church of Panmegiston Taxiarhon, built in 1741, with its very interesting iconography and acoustics.
" 11.30: Guided visit to the Public Library of Milies, historically tied to the famous School of Milies, inaugurated in 1815 by three major scholars who played an important role in the Revolution of 1821 in Thessaly.
" 12.00: Guided visit to the Museum of Folk Art of Milies.
" 13.00: Departure for Vizitsa.
" 13.15: Visit to the "Karagiannopoulos" mansion which is now a guest house.
" 13.45: Visit to the "Women's Partnership Fund of Vizitsa" where traditional products are sold and we will be given treats.
" 14.30- 15.30: Return to Milies and walk from the square of Milies to the railway station where the steam train "Moutzouris-Smudgy" reaches its destination and to the bridge of engineer Evaristo de Chirico (father of famous artist Giorgio de Chirico). Departure for Volos at 15.30.
" 16.00: Arrival in Volos. ( The rest of the day is free for the students).
" 21.00: Dinner with live music at the restaurant "Kanaraki" for the teachers.
" 6.00: Departure of Italian guests.
" 9.00: Departure of Spanish guests.
" ……. Departure of Bulgarian guests from Stara Zagora??
" 12.00: Departure of Bulgarian guests from Dobrich.
" 9.00: Meeting at school and departure by bus for Dimini.
" 9.30- 10.00: Visit to the Mycenean settlement and Neolithic settlement in Dimini. Departure for Sesklo.
" 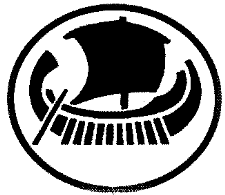 10.30-11.00: Visit to the Neolithic settlement in Sesklo. Departure for Volos.
" 13.00- 14.15: Guided visit to the Archaeological Museum of Volos. (Parents will pick up students at the museum).